The numbers of episodic events that are seen in primary care are infinite. From medication refills to asthma, and low back pain to respiratory infections, there are unlimited numbers of issues that come up in a primary care setting. Some are chronic and need to be followed, and some are one-time conditions that require treatment. Whatever the case, HomeMD can assess, diagnose and treat episodic events via telemedicine. Telemedicine, or medical video chat, will connect you with a health care professional at HomeMD who can help over video chat with most minor and some chronic concerns. For more complex issues, a clinic or home visit may be warranted. With the simple download of an app from your device, you can subscribe and receive unlimited medical video chats/consultations (as well as home visits and clinic visits) to ensure you are covered for all of your health needs. Due to the popularity of our medical app, we have recently expanded our coverage area to the entire GTA region. HomeMD has filled a niche with our 3 platform model, and our professional, licensed nurse practitioners. Personalized, evidenced-based medicine is our mandate and with that, you will receive high-quality, timely and compassionate care. 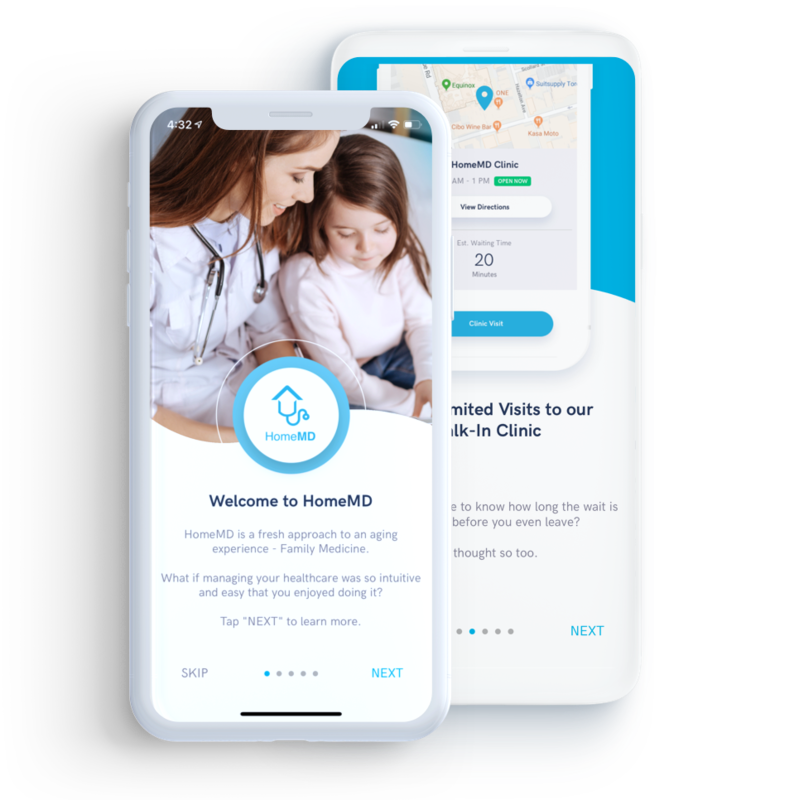 HomeMD is a personalized, digital-first primary health care service that works on a 3 platform model to assess and treat all your health concerns: medical professional web chat, house calls and same-day clinic visits. Our unique app is accessible through your device and makes high quality, effective and efficient healthcare available in an unlimited way with your monthly subscription. Our patients have a wide variety of health complaints, and some episodic events can become chronic. Our team is able to assess, diagnose and treat a wide variety of health issues. For minor events, telemedicine or a video consultation can be used, and for other types of health concerns that may require additional intervention, another platform can be accessed. Episodic events make up a large percentage of our practice and we treat each event carefully to ensure your continued good health. Follow up is always available due to the unlimited nature of our medical app. By making ourselves available for follow up and providing high quality care initially, we hope to foster trust and develop a positive, professional working relationship with all our clients. Say goodbye to long waits in doctor’s offices, clinics and even emergency rooms – our app is relevant today for all generations and has the potential to be the future of healthcare. In today’s climate of fast-moving technology, our app is on the cutting edge of what is next in healthcare and is filling a void that has been left with too many patients, not enough doctors and not enough resources. Nurse practitioners (NPs) are already the primary care providers for over 3 million Canadians. At HomeMD we realized the important role NPs play in our primary care system, and are using that knowledge to our patients’ advantage. HomeMD’s nurse practitioners treat every type of episodic event across all 3 platforms. Whether you need a return to work note, are suffering from allergies or have insomnia, these are all in the purview of the nurse practitioner. NPs are highly educated, licensed professionals who are authorized to assess, diagnose and treat the majority of illnesses seen in primary care. Any emergent cases will always be redirected to an emergency department or a medical specialist, but for the vast majority of cases, our NPs can do the job and can do it well. Getting personalized care is something that is a bit of a lost art in medicine today, and our team works to ensure you feel your concerns are heard and addressed, one by one. Welcome to the next evolution of family medicine in Canada. Now serving the Toronto area, HomeMD features a powerful new app offering a unique platform designed to make your life easier and healthier. Our new software is the next step in patient-centered care. It reflects our goal to design our family practice around you, our patient, and to provide the treatment you need. We offer treatment for a wide variety of episodic events via medical video consultation or other platforms when required.